Aura Kingdom is an upcoming action-packed fantasy MMORPG developed by the creator of the Eden Eternal and brought to the public by Aeria Games, one leading publisher of free-to-play MMO games. Aura Kingdom takes place in an anime-styled vast world rendered with detailed graphics and full of challenges with its dungeons, towers and other terrains. Players in the game can choose their own character/class out of eight initial options and thanks to the elaborate skill system, they can freely customize their avatar with the secondary weapon normally wielded by other classes and a motley of abilities that suit their combat style and allow for deeper strategies. It provides fluid and fast-paced combat as players take on a variety of monsters and bosses in the environments and other rivals in the fierce competition. Moreover, the in-game companions also play their role in the engaging battles. Not only are they adorable yet ferocious pets in players’ side, these companions are more interactive with players as they fight alongside players, join with players to create great combos and even converse with masters in the journey about the past exploits and battles they experienced together. Aura Kingdom made its debut at Otakon 2013 a few days ago with released trailer and basic information. It is scheduled to start its closed beta soon and interested players can sign up for it now. And it will be launched simultaneously in English and French, with more languages planned for future. 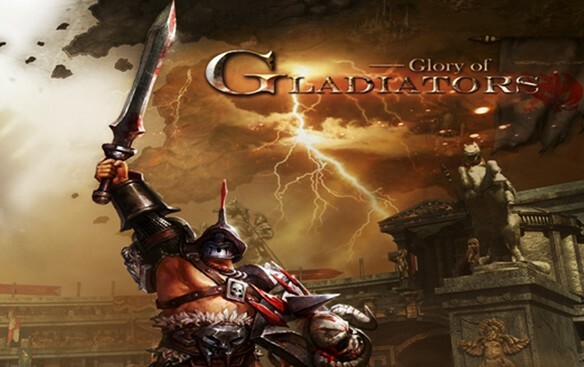 Glory of Gladiators is a free-to-play browser-based strategy RPG from Gamebox, the maker of Project Tank and DDTank2. It puts players in the role of a master of an ancient Roman gladiator training school and quests them with recruiting and training fighters and then sending them to compete with other gladiators in violent confrontations. Following story-driven quests, players can experience famous campaigns and encounter renowned gladiators, and even get the chance to recruit those figures in their own school. The game highlights strategy in place of control or skill. Players need to discover potential fighters among slaves, criminals, captives, and volunteers before training them and honing their skills. With the coins earned through battles, players can purchase weapons to equip their strongest warriors. However, even the strongest warriors won’t be victorious all the time. As players train their fighters, those fighters grow skilled and older. Only those powerful ones in their best years can stay undefeated in the arena. Presented in detailed graphics, Glory of Gladiators features ARPG-style battle visuals where two warriors, displayed against a varying setting, fight against each other using their distinctive battle skills. Players every once in a while need to tap the skill button to unleash their gladiator’s attack. War of Mercenaries is a brand new free real-time Strategy for multiplayer competition. Around fierce wars between rival corps, the game offers players the chance of pitching blood-thirty mercenaries and beasts against each other in one-on-one competition. Break through others’ defense while reinforce your own. War is on! War of Mercenaries doesn’t provide a back story. Directly, it places you into the role of a Sire, who is highly anticipated to lead the nation into glory. If you have ever been the lord of a castle or king of an empire, you will find everything in this nation similar in the core in this land. Build the essential functional buildings, construct the resource producing facilities, set up defensive lines with walls, spikes and turrets, train army units, upgrade everything while unlocking new contents, and toughen up trained troops in various battlefields. The task on your shoulder is not changed. The final goal is to possess great military power and conquer the rest of the land while safeguarding your own castle. For experienced veterans in the field of strategy, there is not anything brand new or innovative that they first experience. That said, you will still be able to capture the twists in some aspects that weigh in its identity and entire quality. A mid-core strategy game, War of Mercenaries adopts a colorful palette instead of the oppressive dark tone to paint a cartoony world, pleasant and bustling. Even in your base, there seems not a moment of laziness but full of vigor – resources are produced in the houses; chosen units come out (at your order) of the hiring quarters gathering in the barrack to practice prowess; flags spread with the wind, pigeons circling the post. And when it comes to the battle scenes, it’s similarly packed with action and animation, but presented in a tenser atmosphere that suits war. You will see your soldiers charge forward, being killed with one arrow through heart or destroying enemy buildings with effort. There will be blood shed on the battlefield and blood stains left there. You can’t do anything about the casualty but can keep blood splatters out of sight with the stashing option. In-game battles are in real-time. To fight a battle is not for the battle’s sake, it’s also an important source of gaining large amount of resources. Looted resources are not only helpful of supporting construction and upgrading but also provide another purpose for battles. When under protection, you can only attack four NPC clans for resources and practice of deployment. With every attack you launched and succeeded, you activate a stronger and better defended castle of the same AI opponents. Initially, you can just send one soldier to win a battle (because there is not any defense), but you can’t since your 2nd try. That’s the uniqueness about the deployment and skills. In every match you have a count-down deployment time, during which you can send the reasonable number of units – not more than needed – to war, for the dispatched soldiers won’t come back even when they survived. So a good commander needs to know the advantages and disadvantages of each unit, the attack range of turrets and the best break-through point of a battle, and also ought to take the casualty into account. Once you are strong enough, you can challenge other real players beginning the evil-for-evil warfare. War of Mercenaries offers satisfactory experience for newbs and veterans alike. It requires you to take some time constructing the base, but generously offers a lump sum of money – the hard currency – to give you an awesome start or momentum; it cuts off the alliance’s part in the warfare, but offers competitive battle which is fun and tactic-required of itself and also closely connected to the construction. From surface to the bone, it has done a good job. All it’s lack is a Sire – You! I’m more screwed up then I thought. Flirting with the date of my girlfriends ex-girlfriend, just to make the ex jealous of me. Wow, how f*cked up can I be? I make a mess out of every situation. My last post was about the fact that I’m in a relationship with Carmen, while I’m in love with Casey.